In this tutorial I am providing you with a video of how to import multiple animations from a single timeline in 3ds Max. 1. Using the tool presented in this video (created originally by Epic and updated for 2013 max by awesome person named Gildor), you can specify multiple exact frame ranges from your animation timeline to export as separate sequences! 2. 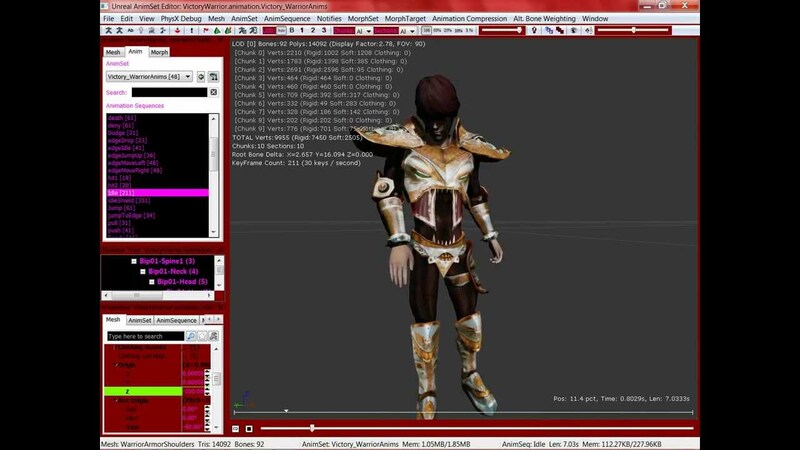 Using the tool, you do not have to select your skeleton, you just have to open the max/maya file containing your animations. If you are trying to export multiple animations in one timeline as an FBX using 3ds max you will probably find it very hard! When I imported the .FBX file for the model you see in the video, which I obtained from 3dfoin, I ended up with a single animation sequences that was 90 seconds long and contained 2700+ frames. If you have an older version of 3dsmax/Maya, just look in your install/binaries/actorX directory. 2. And ActorX workflow is actually quite fast for a large number of anims, I imported 48 different animation sequences in about 20 min! 3. And I can actually get my character in-game with all the 48 animations created by the wonderful artists at 3dfoin! Now you can easily export specific frame ranges from your animation sequences and import them into UDK! This tutorial was insanely helpful after I purchased assets from the same studio, 3dfoin, and encountered the exact same issue. Can't thank you enough! thanks evernewjoy( and Gildor).I didn't know about this plugin.i love actorx and am not so keen on fbx. Glad this helped both of you out!